Degree in Mechanical Engineering or Electrical Engineering or Civil Engineering for Inspector of Factories Post, Degree in Engineering/ Technology or a second class Master’s Degree in Physics/ Chemistry/ Mathematics/ Statistics/ Economics/ Commerce or equivalent for General Manager/ Deputy Director Post, post graduation degree in Veterinary Science (M.V.Sc.) for Join Director Post, degree in Agriculture or a degree in Veterinary Science and Animal Husbandry for Assistant Director (Fodder) and Assistant Director (Admn/ C&DD/ Management/ SA) Posts. Check below notification for post wise qualification details. Pay or Salary: Rs.15, 600/- – Rs.42, 000/- plus Grade Pay. 32 – 52 years as on 01-01-2014. Please check below notification for age relaxation. Rs.210/- through Indian Postal Order payable at G.P.O, Kolkata and crossed and endorsed to the Secretary, Public Service Commission, West Bengal, or by receipted Challan from a Govt. 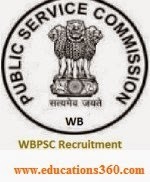 Treasury in West Bengal or the Reserve Bank of India, Kolkata under the head “0051-00-105-State PSC Examination fees-001-Examination fees-16 other fees” and no fee for SC/ ST of West Bengal and PWD candidates. Interested and Eligible candidates can apply in prescribed format along with Self Certified or attested (by competent authority) copies of Madhyamik or equivalent certificate, Caste certificate, PWD certificate, Registration certificate, Mark-sheet and certificates, experience certificate, Two self-addressed un-stamped envelopes and one self-addressed post card and send through registered or speed post to the Secretary, Public Service Commission, West Bengal, 161-A, S.P. Mukherjee Road, Kolkata -700026 on or before 24-09-2014 between 11:00 AM to 03:30 PM.